I am sure most of you have been following the decision of the European Court of Human Rights to ban crucifixes from Italian high schools on the grounds that displaying crucifixes in public schools is a violation of students' religious freedoms. The reasoning of the court was that crucifixes on display might make atheist students and those from religions other than Christianity uneasy. (I'm sure Italy's Quaker community heaved a sigh of relief on knowing they will not have to see crucifixes in the classrooms!) Some of you have also followed the decision in Belgium to forbid headscarves in schools, a measure aimed at Muslims but also affecting Hassidic Jews and students having bad hair days. The latest stunning development in the banning of public displays of potentially offensive religious symbols has been the decision of De Tweede Kamer (the second room) of the Parliament in the Netherlands to ban the public display of bicycle wheels on the grounds that they could be offensive to the Netherlands' rapidly shrinking non-Buddhist population. 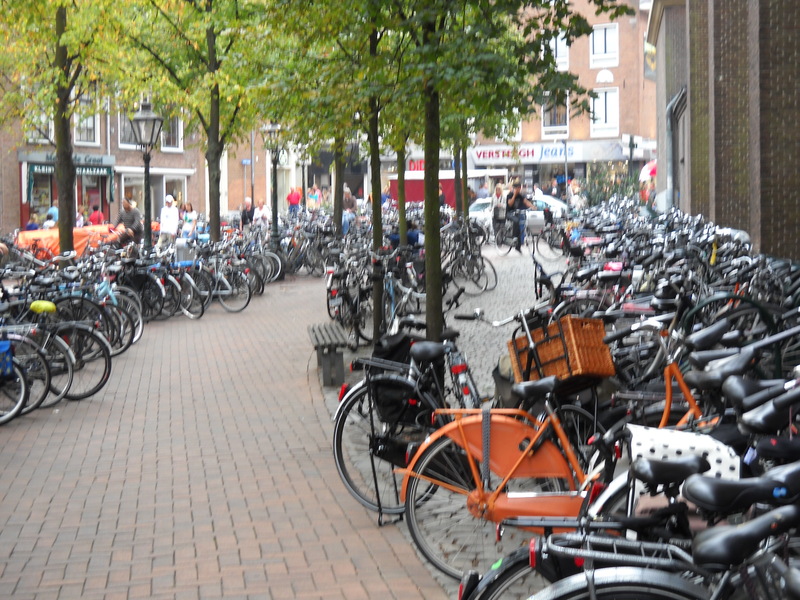 The ban is being rigorously enforced, with the result that one never sees a bicycle with wheels on Dutch streets any more. The Dutch, for whom the bicycle has become an important sacred symbol, now trot through the streets carrying wheelless bicycle frames, a practice locally known as fietsen te voeten (bicycling on foot) or lopen om te fietsen (running in order to cycle). The ban on wheels will extend to automobiles, lorries, trams and trains on December 6, the day after the celebration of Sinterklaas. Rumor has it that the powerful Zwarte Piet lobby was able to persuade The Second Room to provide for a grace period, since Sinterklaas and his Moroccan assistant Black Pete regularly depend on the trains to transport them as they deliver their presents to good little boys and girls. Some Dutch pragmatists have argued that the ban on wheels will be unenforceable, given that the police are all on foot and have no chance of catching a wheeled vehicle seen to be violating the law. The ban on wheels has also angered many Dutch mothers, who report that it has made it much more difficult for them to push their baby strollers. Some claim the sparks that result from pushing a wheelless baby carriage along cobblestone streets pose a health threat to the little passengers. Many scientific studies have shown that the friction of prams and ice skate blades on cobblestone has already caused a dramatic increase in global warming and could contribute to rising sea levels, always a topic of concern in a country much of which is already below sea level. Dutch Buddhists are divided in their reaction to het verbieden van wielen. It is not known exactly how many Dutch Buddhists there are, but experts estimate that somewhere between 0.2% and 98% of the Dutch population are Buddhist by now and that there are approximately sixteen million Buddhist sects, none of which can be civil to any of the others. Some strictly orthodox Dutch Buddhists welcome the ban on wheels on the grounds that the vinaya has no rule that allows monks to ride bicycles. Dutch Reform Buddhists, who believe that all people are predestined either to follow or flout the precepts, argue that the ban will make no difference on how people behave, but they cannot come to agreement on whether that fact weighs in favor of repealing the law or simply shrugging it off. The Dutch Buddhist Coffeeshop Sangha recommends that everyone smoke up and come to their own conclusions about the ban on wheels.